OBLONG REDWOOD POLISHED CASE WITH PILLAR DETAILS STRIKING MOVEMENT WITH TINGTANG CHIMES ON LONG RODS LOVELY SOUND MOVEMENT CLEANED POLISHED AND 1 YEAR WARRANTY 9.5" X 13" X 6"
CLOCK IS 16 " X 11" X 7"
11" TALL X 9" X 5.5"
THE BADER MOVEMENT HAS BEEN CLEANED POLISHED SET UP AND WORKS WELL 1 YEAR WARRANTY . THE TING TANG MOVEMENT STRIKES ON LONG GONGS TO MAKE A RICH TONE . A boys toys piece that definitely is a talking point ! I YEAR WARRANTY /. 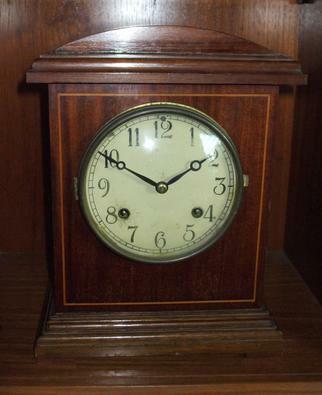 THE WALNUT CASE IS LOVELY AND THE ART DECO SHAPE AND DECORATIONS MAKE THIS A VERY SOUGHT AFTER PIECE . 9" HUGH X 14 " X 6"